Prof Steve Peters is one of the most knowledgeable speakers I have had the pleasure of listening to. His humble, objective approach to his experience is both inspiring and interesting. Steve is personable, funny with a no nonsense approach. He shows great compassion and care whilst delivering a wealth of user friendly knowledge and advice! Loved it! Thank you to all the Chimp Team! 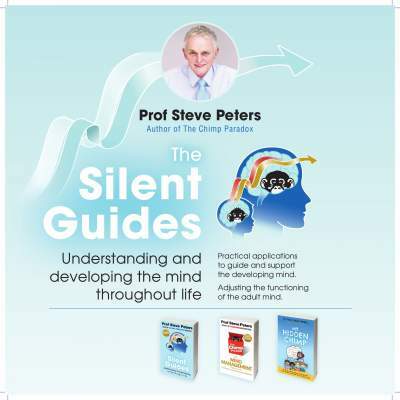 "Lots of great information delivered in an accessible and fun way"
I am a great fan of Prof Peters' books and have been lucky enough to see him speak several times. On each occasion I always seem to learn something new and to be reminded of some useful ideas etc. Steve seems to work hard to ensure that what he wants to get across is as easily understood as possible. I really like that as my own experience shows that understanding how your mind works can make a huge difference to feeling happy and fulfilled. Seeing yesterday's talk added a lot to my understanding of the Silent Guides book and wider theories. So I learned quite a bit and really enjoyed doing so. For me that was a great result. What a fabulous evening, I didn’t want it to end, it was very informative, interesting and funny. I am already keeping my eye out for the next one. Thank you. If you have already read the chimp paradox then I wouldnt recommend seeing this as you really do not learn anything new.